The question of multiple copies goes to the heart of what an icon is: “icon” is simply the Greek word for “image” (eikon). Art historians conventionally apply the term to a particular sort of devotional image used in the Eastern church, usually painted on a gilded panel in an abstract, static, and hieratic style. But an icon is not a representation—it is a reproduction. 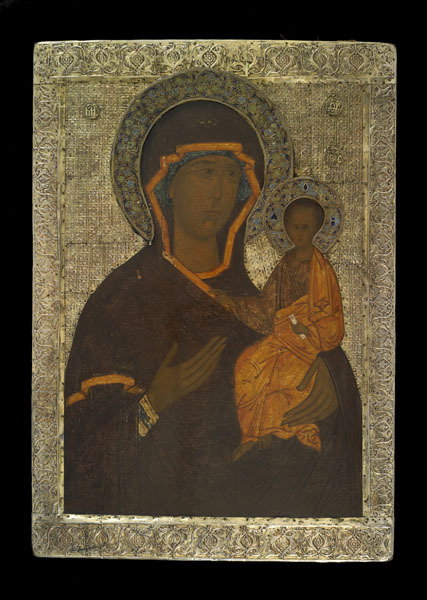 For Byzantine Christians and Orthodox Christians today, any icon, no matter its iteration or material (not limited to painted panels), is a true copy of its model. The model is not the image per se; rather, it is the holy personage or event depicted. Byzantine theologians used the analogy of a wax impression and seal to describe the relationship. The seal (the holy person) can impress the image (the icon) over and over again. Icons’ inherent power must stem in part from the way they seem to have evolved out of the cult of relics. Early pilgrims to holy sites returned home with something tangible—flasks containing water from the River Jordan, for example, or soil from the place where a saint lived or died—that had been in actual contact with the holy person or place. These were not simply mementos but rather were possessed of real potency to do such things as heal, cure infertility, or relieve grief. Early accounts suggest that a relic was “activated” in visions experienced by the person looking at it and to it for divine aid. The miraculous visual dimension assumed concrete form when the relics, such as the water flasks or lumps of earth, were “improved” (and also authenticated) with stamped images appropriate to the saint or shrine. The images eventually became autonomous, no longer physically tied to the material stuff of a relic yet still carrying its power—they were icons.